You already changed colours but so far you used colour names to do it. There are over 200 named colours but there is a better way to select colours. Open _template.css and save it as beginner.css. Open links.html and save it as colours.html. Add a link element pointing to beginner.css (you could copy the one from external.html and edit the file name). Test the page but there should be no styles. Indent it once to show that it is inside the brackets. 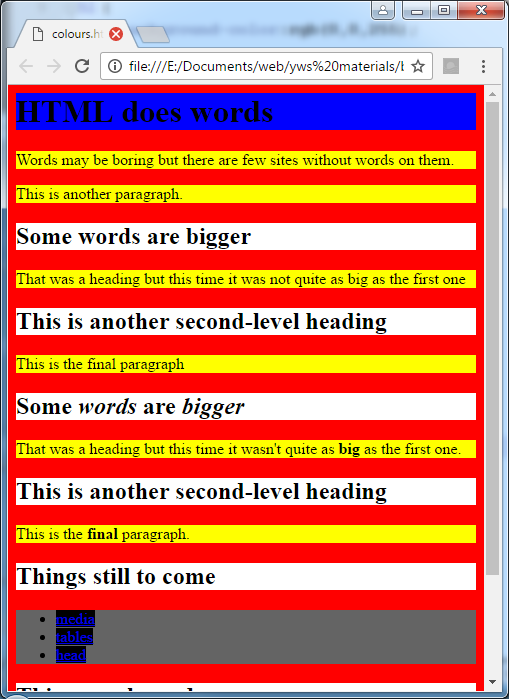 Save both files and view the HTML one in a browser. The whole page should be red. If it is not make sure both files are in the same folder. This is mixing light so the end results are not the same as mixing paints or pigments). Using color, background-color and rgb you should now be able to colour anything. If you have trouble working out the colours just search on-line for rgb colour picker.